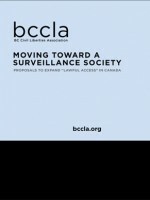 The federal government has proposed new legislation that seeks to expand “Lawful Access” powers by law enforcement agencies (“LEA”s). Although justified as necessary “modernization” and just “keeping up with criminals”, the proposals are deeply problematic. They would take advantage of new technologies, new modes of communication and new social practices to significantly expand access by LEAs to the personal information of individuals. Indeed, while referred to as “Lawful Access” powers, the lawfulness of some of these powers under the Charter of Rights and Freedoms is questionable. • Expanded scope of warrants for telephone number recorders to encompass all forms of transmission data. The increased legal power that these proposals would expressly grant to LEAs will be greatly enhanced by the real world context of vastly more and richer personal data now available as a result of new technologies. In a “double whammy” to individual privacy, the reforms would provide LEAs with powerful new tools by which to tap this growing source of investigational data already available for investigations and intelligence-gathering. Moreover, they would do so on the basis of lower evidentiary standards – or in the case of subscriber data, no evidentiary standards at all – thus further eroding the fragile framework of privacy protection that we have constructed to control state surveillance.